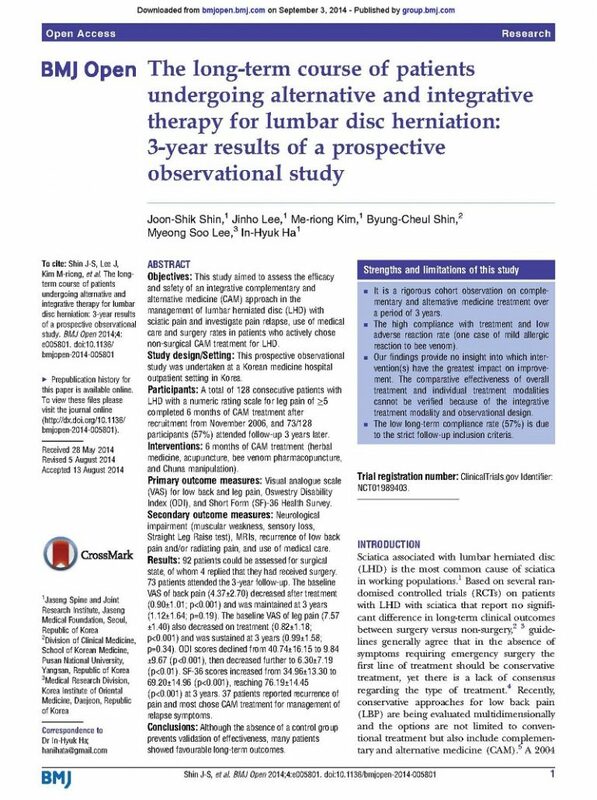 Objectives: This study aimed to assess the efficacy and safety of an integrative complementary and alternative medicine (CAM) approach in the management of lumbar herniated disc (LHD) with sciatic pain and investigate pain relapse, use of medical care and surgery rates in patients who actively chose non-surgical CAM treatment for LHD. Study design/Setting: This prospective observational study was undertaken at a Korean medicine hospital outpatient setting in Korea. Participants: A total of 128 consecutive patients with LHD with a numeric rating scale for leg pain of ≥5 completed 6 months of CAM treatment after recruitment from November 2006, and 73/128 participants (57%) attended follow-up 3 years later. Interventions: 6 months of CAM treatment (herbal medicine, acupuncture, bee venom pharmacopuncture, and Chuna manipulation). Primary outcome measures: Visual analogue scale (VAS) for low back and leg pain, Oswestry Disability Index (ODI), and Short Form (SF)-36 Health Survey. Secondary outcome measures: Neurological impairment (muscular weakness, sensory loss, Straight Leg Raise test), MRIs, recurrence of low back pain and/or radiating pain, and use of medical care. Results: 92 patients could be assessed for surgical state, of whom 4 replied that they had received surgery. 73 patients attended the 3-year follow-up. The baseline VAS of back pain (4.37±2.70) decreased after treatment (0.90±1.01; p<0.001) and was maintained at 3 years (1.12±1.64; p=0.19). The baseline VAS of leg pain (7.57 ±1.40) also decreased on treatment (0.82±1.18; p<0.001) and was sustained at 3 years (0.99±1.58; p=0.34). ODI scores declined from 40.74±16.15 to 9.84 ±9.67 (p<0.001), then decreased further to 6.30±7.19 (p<0.01). SF-36 scores increased from 34.96±13.30 to 69.20±14.96 (p<0.001), reaching 76.19±14.45 (p<0.001) at 3 years. 37 patients reported recurrence of pain and most chose CAM treatment for management of relapse symptoms. Conclusions: Although the absence of a control group prevents validation of effectiveness, many patients showed favourable long-term outcomes.